With no windshield to hook the front of the top onto, the canvas gives a very shabby appearance. 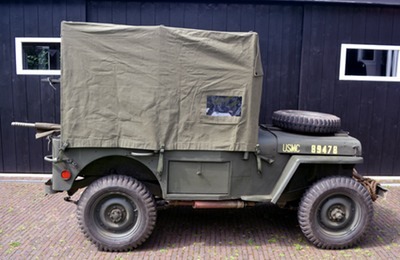 With the sides rolled up. 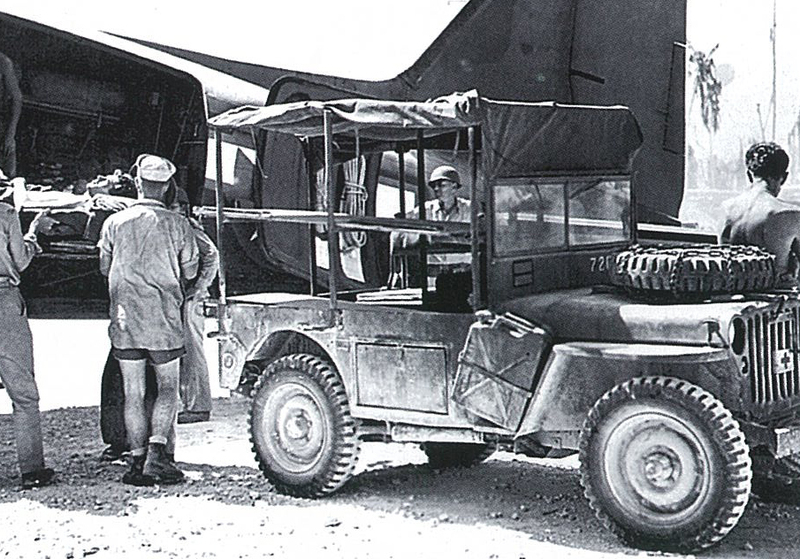 Saipan, 1944. 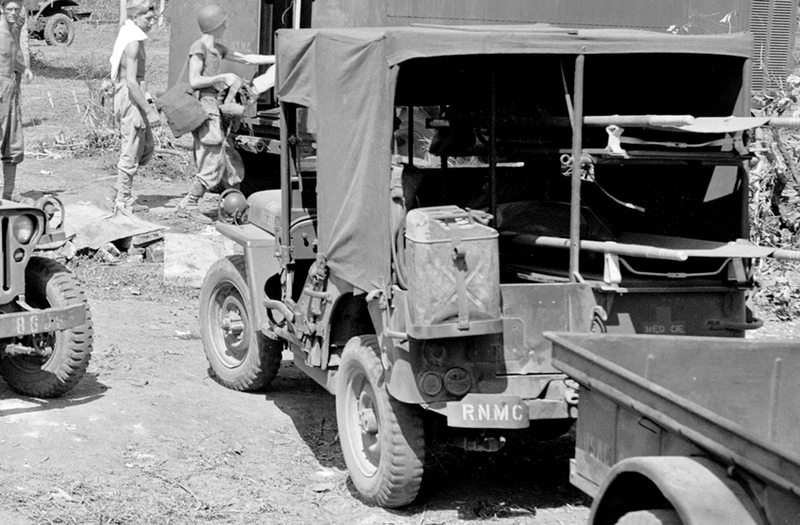 A 5th Marine Division ambulance jeep stewed to the gills with folding litters comming ashore on Iwo Jima. Note that the windshield is up, but the frame with the glass is removed. Most of the photo’s and film footage we know of the ambulance shows them with the canvas top mounted. 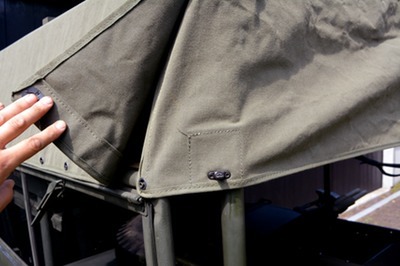 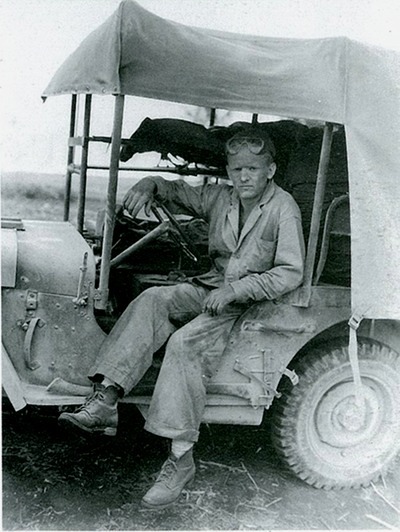 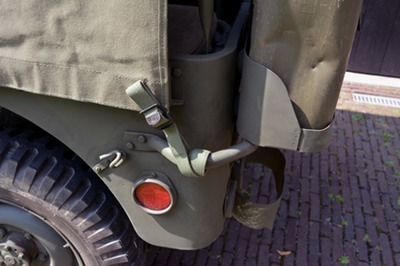 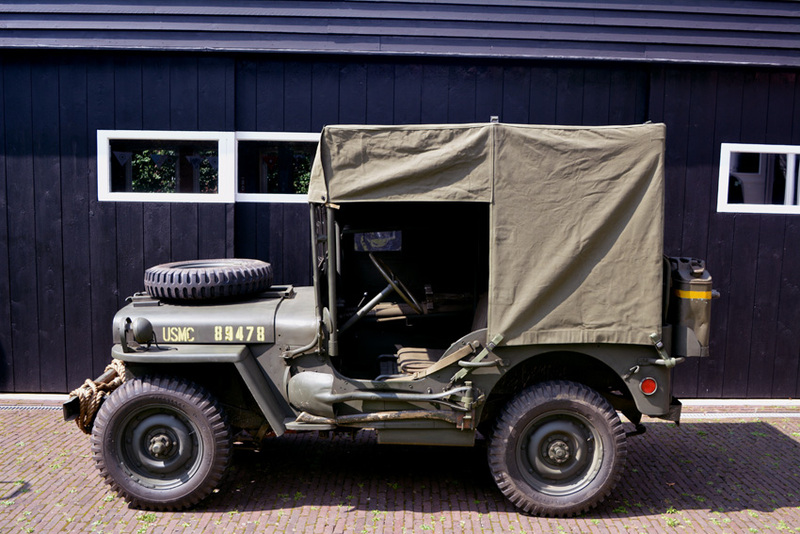 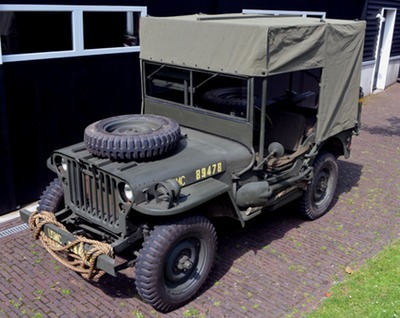 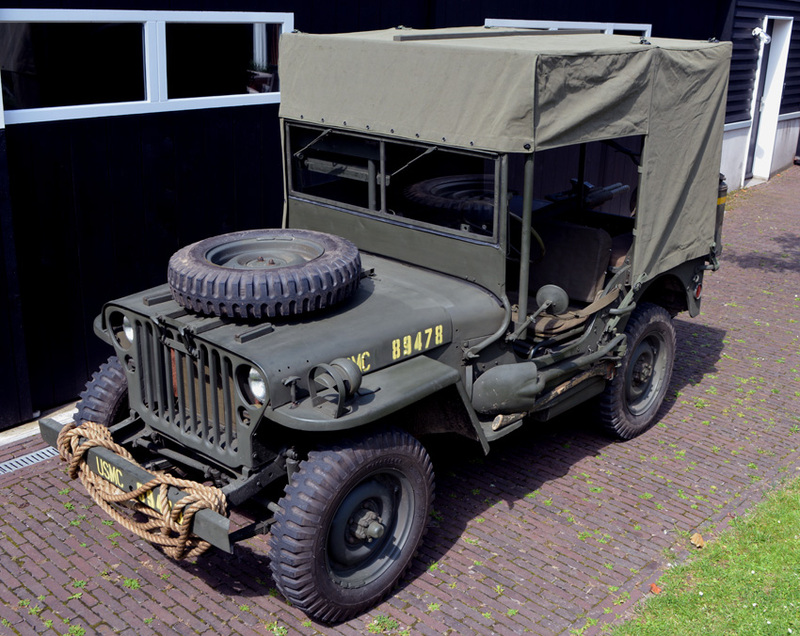 While standard jeeps were usually stripped naked by the marines, the canvas top was nearly always used. The reason is simple: in the hot climate of the pacific the top offered necessary protection from sun and dust on Saipan and Iwo Jima, while on Cape Gloucester and Okinawa the wounded were protected from the heavy rain. 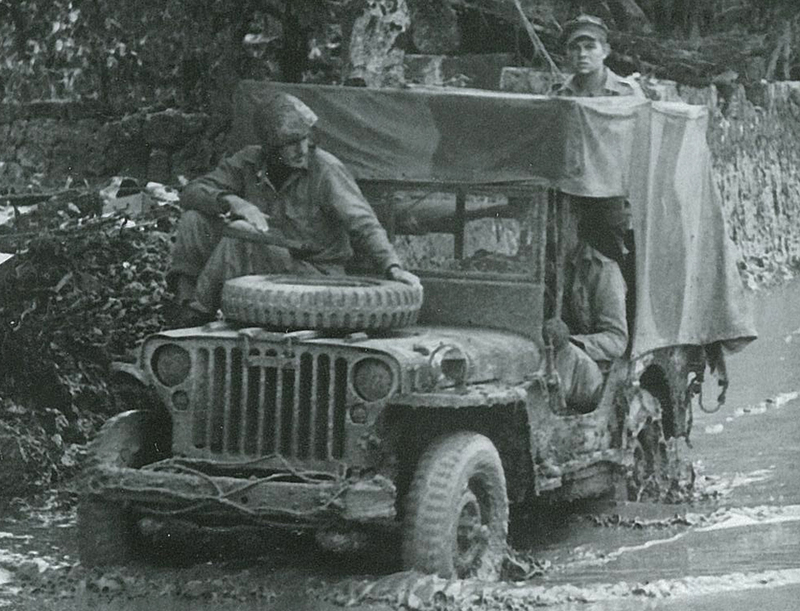 On Okinawa the the canvas top protected the wounded against the torrential rain. 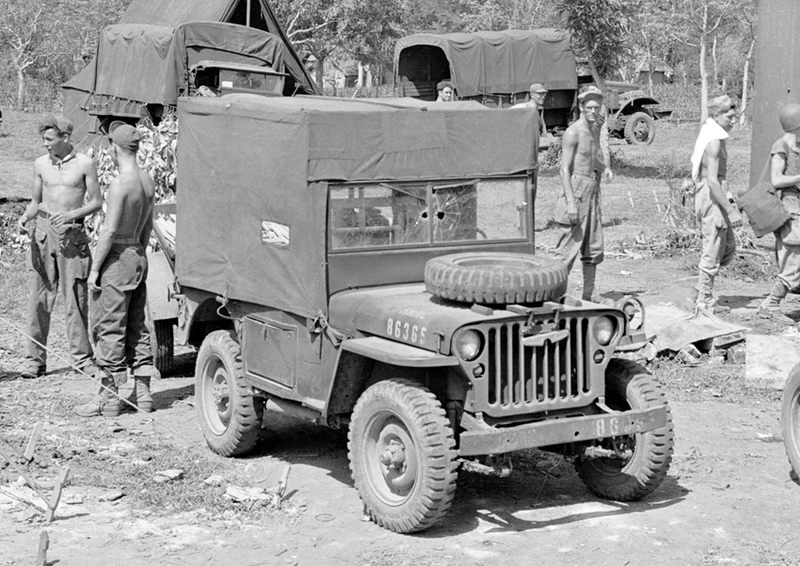 Note the camouflage scheme painted on the canvas. 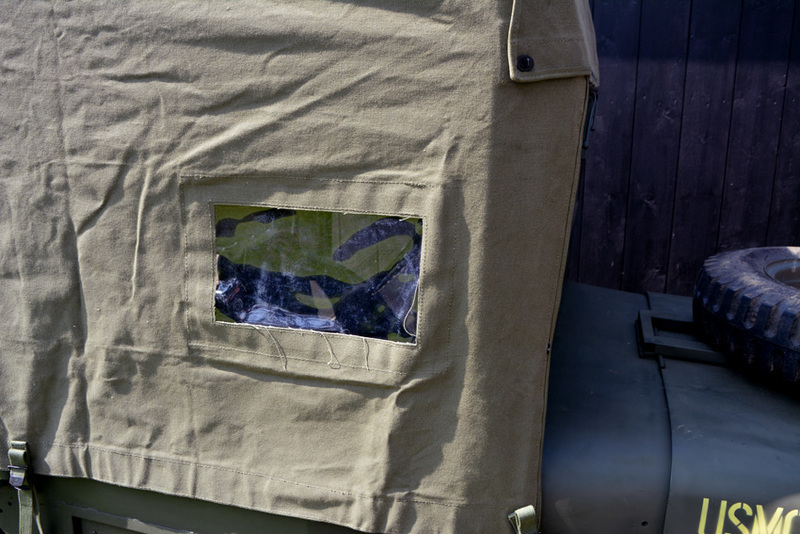 Since it was impossible to find an original canvas top we had to recreate it from the old photo’s. 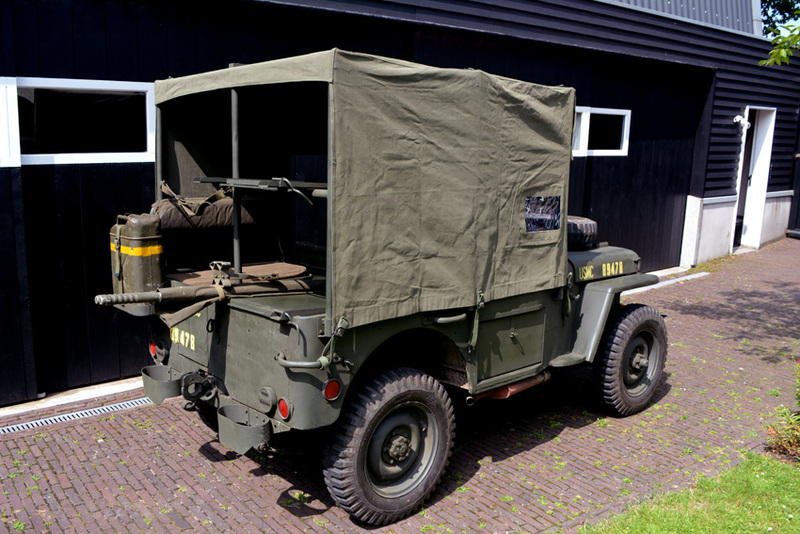 After some study it became clear to us the different types of ambulance jeeps (early low version and late high version). 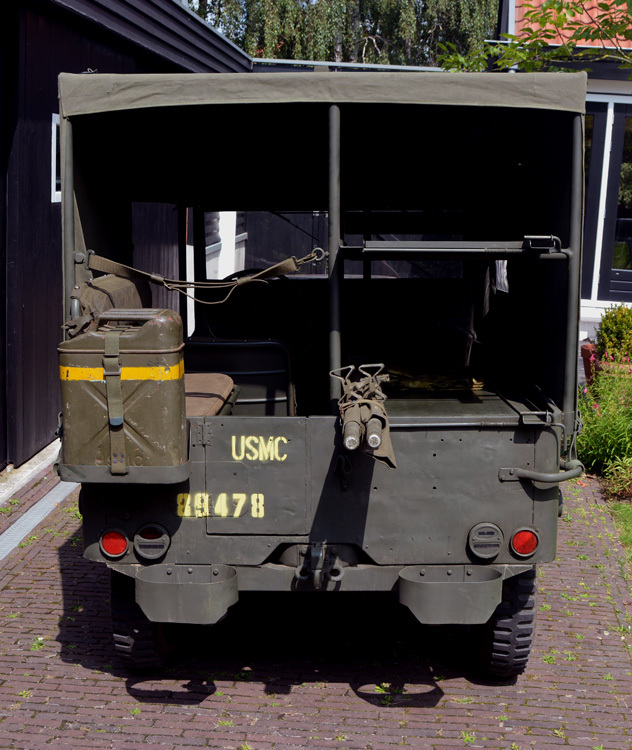 There were a few differences besides the measurements. One of the "improvements" was the introduction of a little window on the front right side. 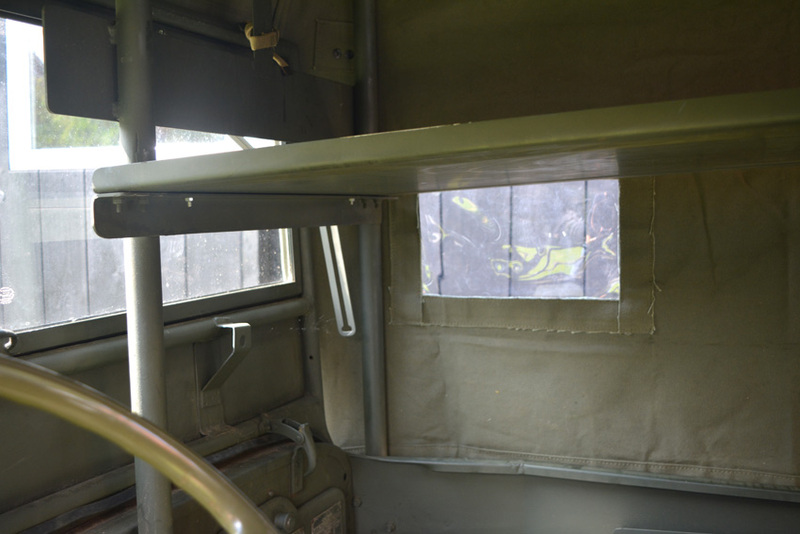 This clear cellulose acetate window was positioned right below the top litter shelf. 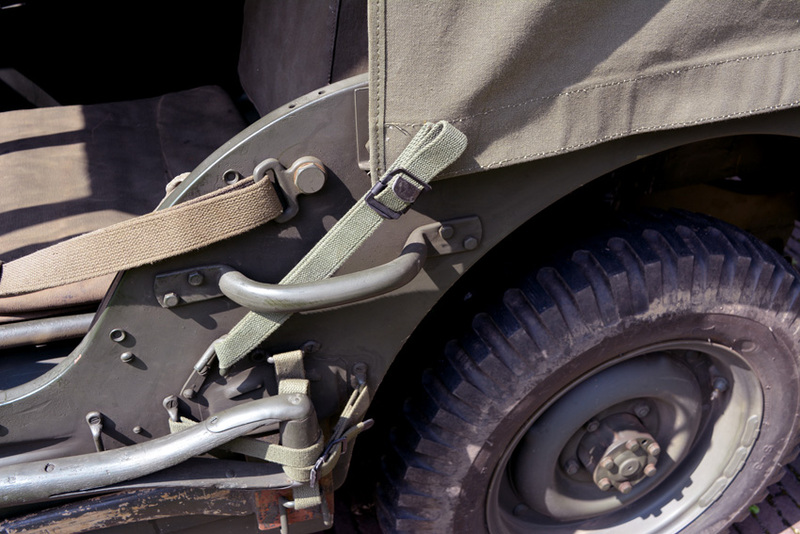 Since this is lower than the drivers head, it is not realy of any practical use. 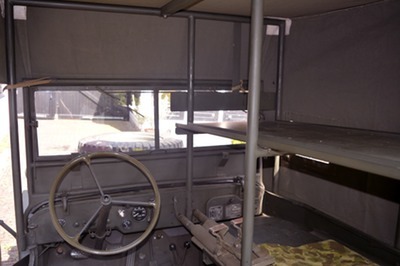 The driver has to bend over and look under the litter shelf past a wounded man on a litter placed on the lower shelf to see anything but a blurry view of the surroundings! 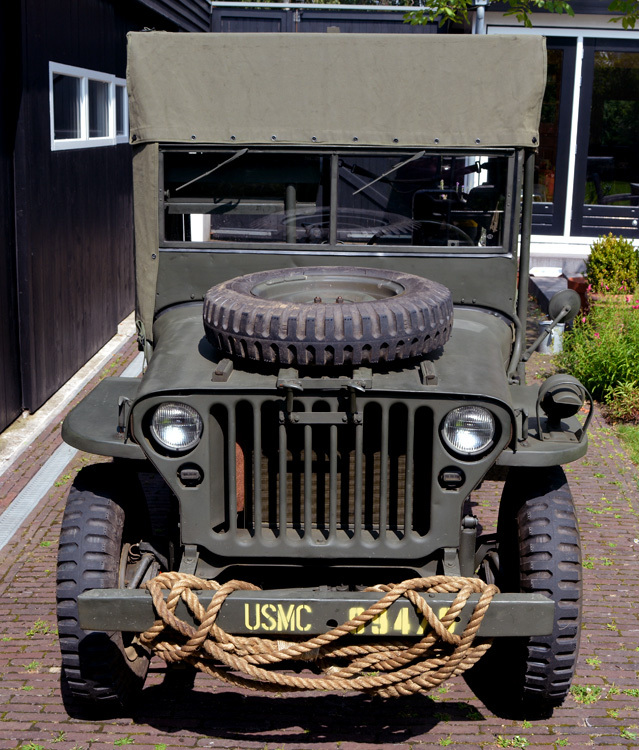 On the roof a wooden beam was added to give the top more sturdiness and prevent flapping of the canvas while driving. Another ambulance jeep at the same place as in the photo shown above gives a view on the wooden beam located on top of the canvas to secure it to the frame. 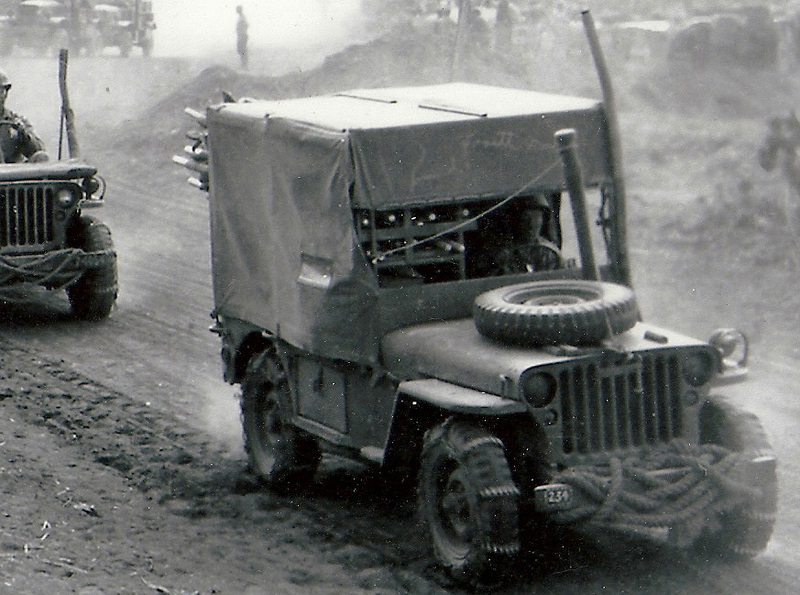 Later in the war or during the Korean campaign more adjustments were made. 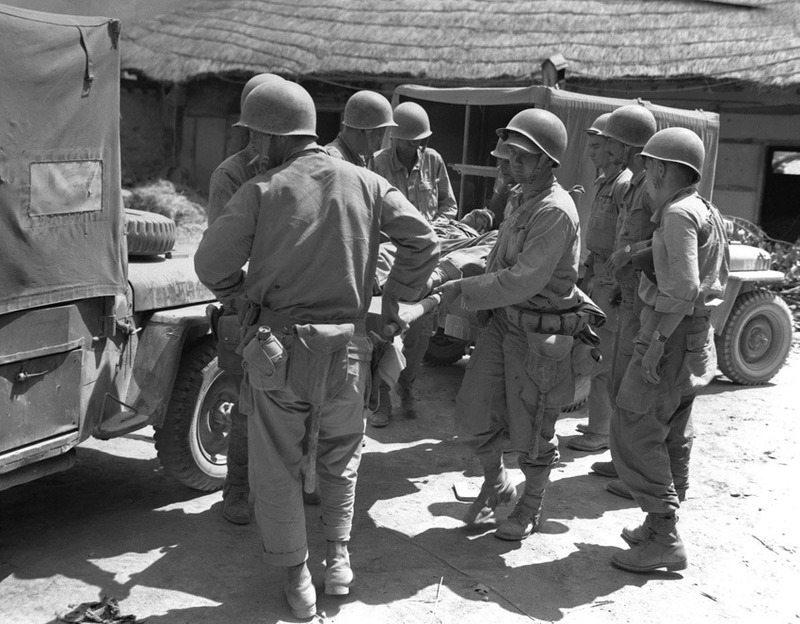 One example is the fact that wartime tops had canvas straps to fasten them to the body while the Korean version shows that the tops are fastened with ropes. 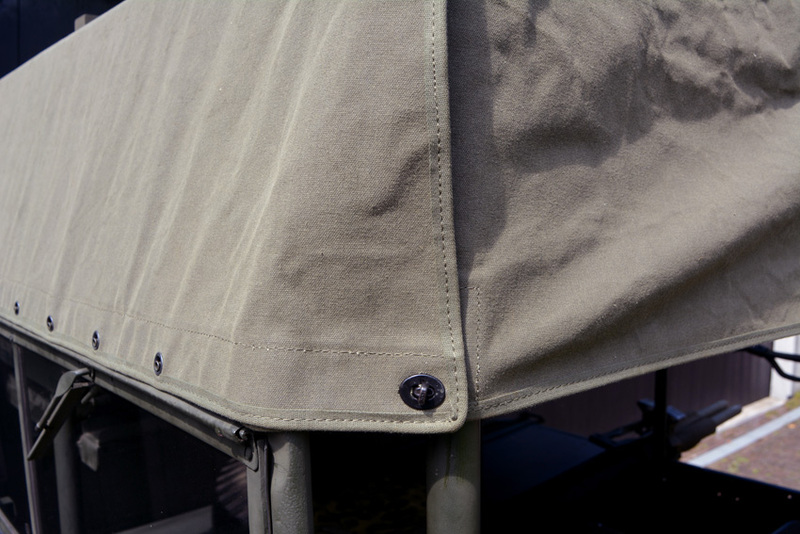 Instead of sewing a strap to the canvas top a grommet was placed in the canvas through which a short piece of rope was passed to secure the top to the body. 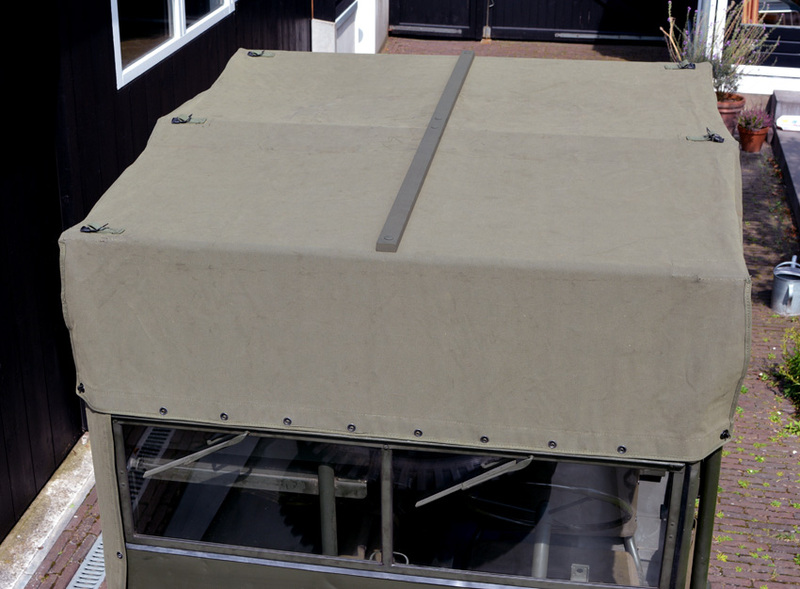 Also other versions how to roll up the top were introduced. During the Korean War a wounded Marine is taken out of an ambulance jeep. Note the small window in the right side of the canvas top. On the top edge can be seen a strap with buckle hanging loose. 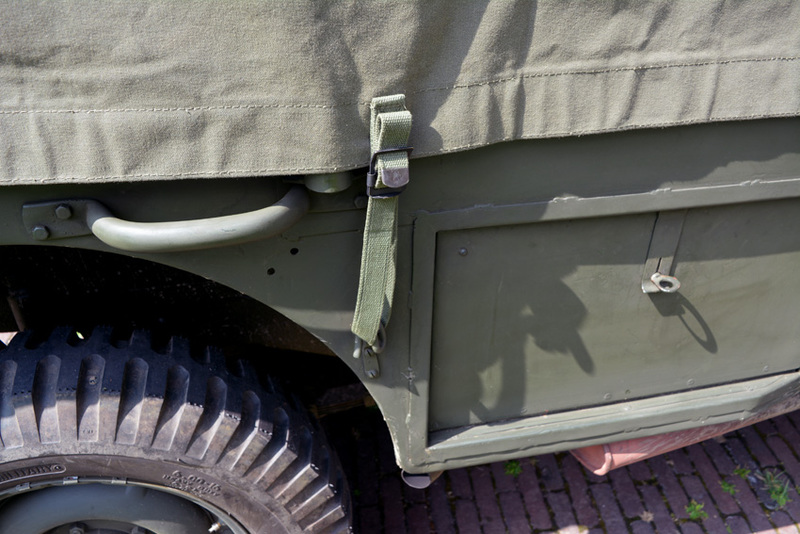 Is this a variation or a field repair? On the lower front of the canvas top can just be seen the grommet to which the short rope is attached.